Second up in our travel hotel review series are 2 of our favorite countries. We have spent a lot of time in Thailand and Malaysia this year but Cambodia and Laos are where we found adventure, peace and deep connections with the culture. It is also where we found some amazing hotels at even more amazing deals. None of these are luxury spots, that just isn't really our style. But they were all clean, comfortable, and perfectly sufficient for a nights rest, and in some cases even more! 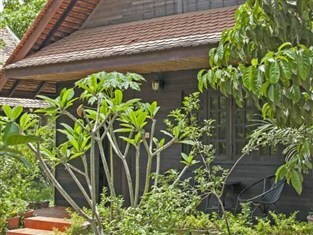 Palm Village Resort, just outside the main town of Siem Reap was perhaps the loveliest place we have stayed thus far. The staff was incredibly welcoming and adored our children. We rented the triple room, which came with a double and a single bed. 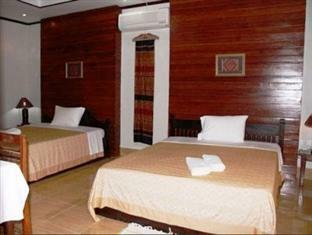 The room was nothing special, but it was comfortable and clean with AC, TV and a large bathroom. The attached restaurant served a nice variety of food, even made to order for the kids. The included breakfast was large and also had a wide variety of Khmer and Western cuisine. The WIFI internet worked well in the room...most of the time! The best part of this hotel was the location and garden filled surroundings. Set just outside town you could really get a reprieve from the hectic day touring the temples or hanging out in town. The hotel also had a large pool which was a relief from the humidity and heat of Cambodia. They also have a wonderful tuk tuk driver who was able to stick with us the entire time taking us to temples, dinner, or basically anyplace we wanted for an extremely reasonable fare. 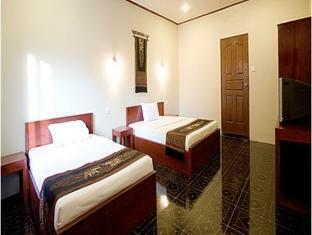 Battambang Lotus hotel is a bit obtrusive when first entering. It appears a large hotel and when you enter the furniture is large and quite imposing. Beautiful but somewhat out of place. The rooms are lovely and again clean. Bathrooms even had a bathtub which is a nice option not offered very often in Asia. The rooms come with SAT TV, AC, and a lackluster breakfast but certainly better then nothing. The WIFI worked well when it was on but we found that it went in and out often. The location is not the best as its not walking distance to town but on several occasions the manager of the hotel offered to take us to town to run errands and a tuk tuk costs very little if you need to go that route. There is a nice salt water pool and many areas for relaxing around the lobby. Cyclo was definitely the coolest room set up we've had so far. For $40 we had a nice little living room area, refrigerator, large bathroom with tub, a bedroom and a airy balcony. Upstairs, in a loft type area, we also had another bedroom and small bathroom. It was a fun set up for the kids but admittedly the beds were really hard! The WIFI worked well throughout the room. We had a different a room upstairs at one point and the internet did not function as well so try and get a lower floor room if that is important to you. They offer many room types to fit every need. The property also has a nice French themed restaurant, large hang out area on the roof complete with a huge jacuzzi, an Xbox and a pool table. The location was great, near a mall and lots of cool little side streets to explore. 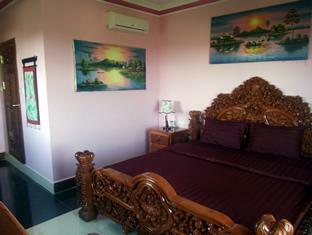 Sihanoukeville is FULL of inexpensive hotels. 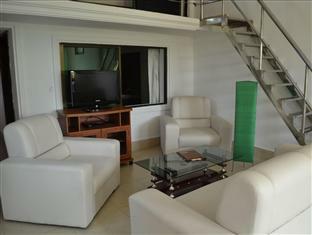 We chose Beach Road as it was centrally located and one of the cheapest with AC and a pool that we could find. The rooms were clean, spacious, and the WIFI worked great. The rooms we had came with SAT TV and a refrigerator, always nice additions. The location was good and bad. The good; a spa and a movie theater were attached to the hotel, the restaurant was large, comfy and had a nice variety of food and a pool table, and the beach was a short walk down the road. There was also a nice pool but it didn't seem very clean by the end of our stay. The chlorine level simply rose each week. The bad; that would have to be the large nightclub attached to the back end of our room. The music blared until 2am, not an issue for us really but for some I know this would be a deal breaker. We got a 30% discount for staying for one month. This made our cost $28/night for two large rooms. I knew when I was in the capital of Laos I wanted to be on the river. Most of the hotels were outside our price bracket until I stumbled upon the Suksavanh. It is in a perfect location, right across the street from the Mekong River and an easy walk to loads of great restaurants and a beautiful and large playground. The rooms were nothing special but they were clean, had 2 large comfortable beds, SAT TV, solid WIFI, and a fridge. The restaurant onsite provided a nice breakfast and the staff was really great, always going above and beyond to help. My 5-year-old was quite the hit! There is no pool but for a small fee the hotel next door will let you swim all day. Vang Vieng is one of our favorite spots we have traveled to so far. Part of why we loved it so much was the hotel. It was not fancy, but it was inexpensive and perfect for what we needed. The only downside was the internet, it was a very weak signal and really why we left after 3 weeks. But that being said, none of the hotels seemed to have good WIFI, maybe something to do with the stunning limestone cliffs surrounding the town. Maybe the connection has improved since our visit. For a more in depth look check out this video . The room was basic but clean and the owners became like family after the first couple of days. The breakfast was amazing and the food throughout the day was even better. We squeezed into one room and they didn't mind at all, even gave us all breakfast free of charge. Perhaps the best part was the location. It is sort of a party town and can get loud in the evenings. Laos Haven is set at the far end of of the strip so it was quiet at night yet still close enough to easily walk to everything. After being on the road for over a year we have figured out what works and what doesn't when looking for accomodations. First of all, we like to book our hotels slightly in advance, in order to avoid the whole, traipsing through town with 3 kids and tons of luggage deal. We also only book 1-2 nights in case we don't like it and want to move on! There are loads of great sites when looking to book a hotel like agoda, booking, or hostelbookers. Sometimes though we want more then a hotel! Wimdu is one site where we go to find affordable apartments and unique lodging opportunities. Sometimes hotel living can get to us and having a kitchen to cook familiar foods in and more space to spread out in is just the cure to fix our hotel funk! If living in hotels is just not working try and branch out to a different living environment and see if that helps! god i love how differently we travel you and i mary love. and still, i love it. i do. you teach me so much. and the pics look amazing! I love the unusual shape of these Thai buildings, the hotels seem pretty comfortable and not too expensive with food I guess. Sounds like you travel like we do. Not quite on a shoestring, but some comforts. This list will come in handy. Exactly, we don't need or even like anything fancy but stuffed in a dingey hostel to save $10 a day is just not something we want to do! In SE Asia there is a such a nice spectrum to choose from. We used Agoda a lot but often times bargained once we got there, especially if we were staying longer! This is exactly what I needed! Trying to roughly figure out our next year and this helps so much. Thanks! I am so glad! Happy to help at all. Cambodia and Laos were by far our favorite countries. 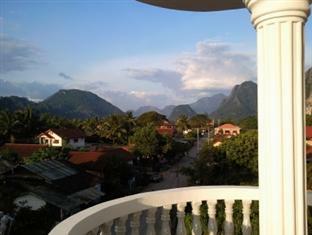 Beware of the Internet in Laos though....everything else there is pretty but Internet speed...not so much!